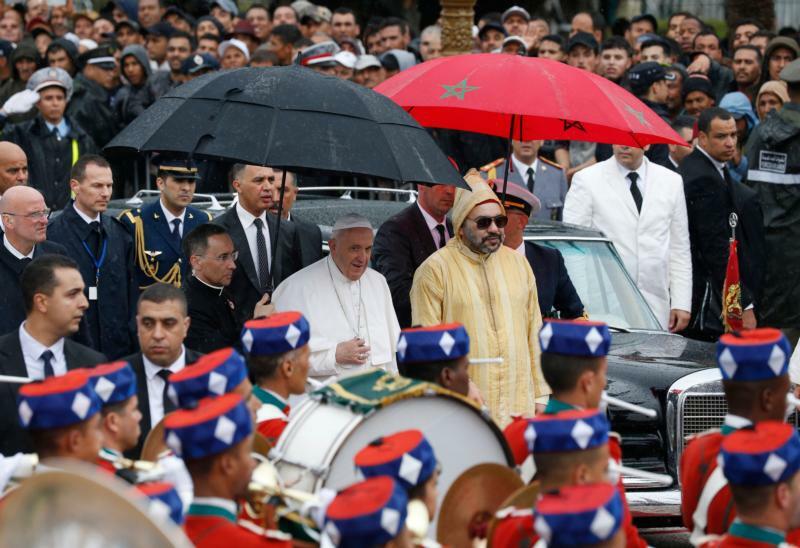 RABAT, Morocco (CNS) — Greeted by King Mohammed VI, a steady rain, ululating women and cheering crowds, Pope Francis arrived in Rabat March 30 for a 28-hour visit to Morocco. The king, who has the constitutionally assigned role of “commander of the faithful,” told Pope Francis that role includes being “guarantor of the free practice of religion” for Muslims, Christians and Jews. “Religion is light; religion is knowledge; religion is wisdom,” he said. “And because religion is peace, it calls for diverting the energy spent on weapons” to other, “loftier pursuits,” he said. Pope Francis described his visit as another occasion to promote interreligious dialogue as part of the celebrations of the 800th anniversary of the meeting of St. Francis of Assisi and Sultan al-Malik al-Kamil in Egypt. Religion is not just about an individual’s relationship with God and eventual hope of heaven, he said. All religions teach the sacredness of human life and anyone who claims faith in God must demonstrate that through the highest level of respect for the life and dignity of others. Respect for life and for all God’s gifts also implies respect for creation and caring for the poor and for migrants, the pope said. Christians and Muslims can and should work together to protect the planet and assist those in need. Pope Francis also urged further steps in Muslim-majority countries to progress beyond seeing Christians and Jews — “people of the book” — as minorities to protect and instead recognize them as full citizens with equal rights and obligations.